UPDATE: So Scottish has been scratched, but I’m sticking by my number 2 selection. Big Orange to actually run and get up! After watching the replay of the Caulfield Cup so many times I know the race-caller’s description off by heart, I’ve got the Melbourne Cup winner for you – Scottish. A week ahead of time, too. You can thank me later. Seriously though, Scottish’s run in that race was phenomenal. I’ve seen all the lead-up races to the big one on the first Tuesday in November and that was the best cup trial. Do yourself a favour if you haven’t had a close look yourself yet and check out a replay. It’s hard to believe Scottish was able to run second when you consider the huge amount of work he had to do in the race. Scottish was slow out of the barriers and as he tried to make up a little ground down the straight the first time he got squeezed sideways towards the fence, at which point he started throwing his head about. His jockey, Kerrin McEvoy, decided the best option from there was to let the horse go forward and Scottish went into the turn out of the straight fives horses wide. He had to be kept going to try to get around the field and at about the 1200-metre mark of the 2400-metre event he finally got to the lead and crossed to the fence. It was always going to be a big ask for Scottish to go on and win from there. Surely he was going to get worn out and drop back into the ruck at the finish. But, while he didn’t win, only one horse could get past him and that was the favourite, Jameka, who had enjoyed a charmed run by comparison. 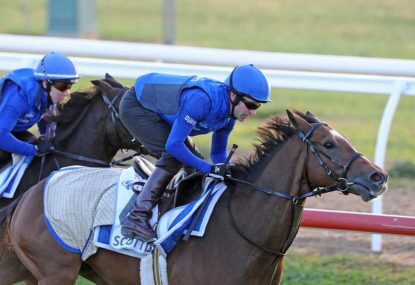 If there’s a worry with Scottish it’s the fact he hasn’t raced over 3200m before and if he wanted to go quicker in the Caulfield Cup will he have trouble settling in the Melbourne Cup. Hopefully, his trainer and jockey can manage to guard against that. It makes sense that Hartnell is the favourite for the cup and Jameka the second favourite. Hartnell has been the outstanding horse of the spring apart from the incredible Winx, who, fortunately for the cup hopes, isn’t a 3200-metre horse. Included in Hartnell’s wins was a decisive one over Jameka in the Turnbull Stakes, after which Jameka went on to win the Caulfield Cup. Winx blew Hartnell away in just a few strides when they came to grips before the home turn in the WS Cox Plate at Moonee Valley last Saturday, but Hartnell did well to still hang on for second when he could’ve easily faded to finish behind the placegetters. But neither Hartnell nor Jameka has a strong grip on the cup and while this year’s edition of the race won’t be among the best we’ve seen in terms of the overall quality of the field, there are a number of genuine chances. Exospheric and Almoonqith each finished very strongly for third and fourth respectively in the Caulfield Cup. Their runs said they would be better suited over the longer distance of the Melbourne Cup and the bigger track at Flemington. Almandin is owned by Lloyd Williams, who has made an art form of finding potential Melbourne Cup winners to buy. The horse has taken a relatively low-key path towards the big race compared to some of the other runners mentioned here, but has still been very impressive. And British horse Big Orange is back as a five-year-old for another crack at the cup after running a splendid fifth last year, when he led. Big Orange will be much better off for that experience and he since has the form on the board in the UK. Other chances: Jameka, Almandin, Almoonqith, Exospheric. Why wait any longer for a Melbourne Cup tip?